Yesterday I had, what could only be called, a meltdown. I needed to head out to the store to stock up for a week of recipe making/photographing and instead, I sat frozen at the dining room table thinking through all the things I needed to get done. Finally, with tears in my eyes, I found my husband and asked for a hug (at which point I started bawling.) He, with a gift for words, talked me through everything and calmed me down (one of the many reasons I’m so grateful to have him in my life). In addition to coping with the deadlines and stress, I’ve been trying to focus on eating a bit better (because pizza) and also start planning for when we don’t have gobs of cookbook food stashed in the refrigerator. 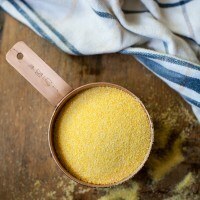 I’ve whipped up this polenta a few times. 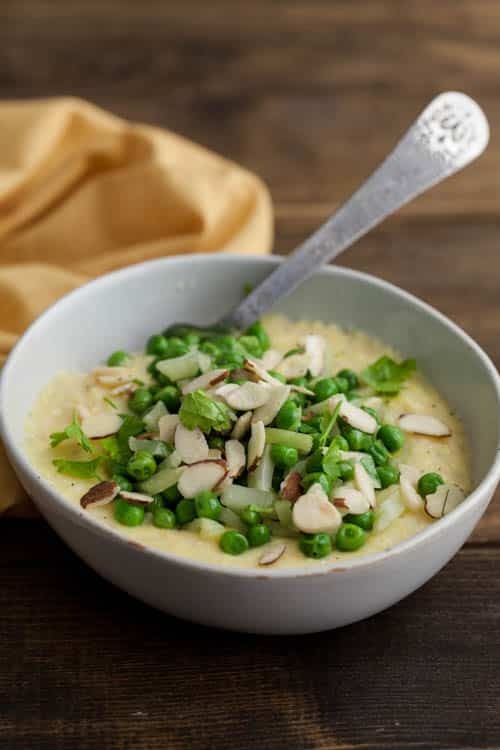 I find the creaminess extremely comforting while the fennel, lemon and pea combination has a bright, fresh flavor (a perfect nod to the slightly cooler weather we’ve had the past couple of days after a few 90˚ days.) I know I say this a lot on this site, but seriously, polenta is easy to make- just make sure to have it on the lowest heat possible (my stove has a burner specifically for simmering foods over the lowest heat- it works great!) Also, if you want more spring/pea comfort recipes, I’m in love with the ricotta gnocchi I used for my recipe on The Kitchn. In a small pot, bring water to a boil. Pour in polenta and turn the heat down to the lowest heat possible. Cook, stirring polenta occasionally, for 15 minutes (easy/done) to 30 minutes (longer/better flavor.) Remove from heat and stir in the butter, cream cheese, milk, sea salt, and black pepper. Let sit while cheese and butter melt. In a skillet, heat olive oil over medium-low heat. Stir in the diced fennel, and cook until tender and fragrant, 4-5 minutes. Add peas, cooking for another 2-3 minutes until hot. Remove from heat and toss cooked vegetables with parsley, sliced almonds, lemon juice, and lemon zest. Divide polenta into two bowls and top with pea mixture. I absolutely love polenta and order it when at a restaurant quite often, but I have never made anything with it myself. I bought some a couple of weeks ago with the intention of using it, but I still haven’t. So, I will give this a try tomorrow – it looks greats. I know how you feel, and boy do those tears come easy to me in the middle of a stress fit. And I am not even knee deep in a book; not sure how you are doing it but lady, I admire it! 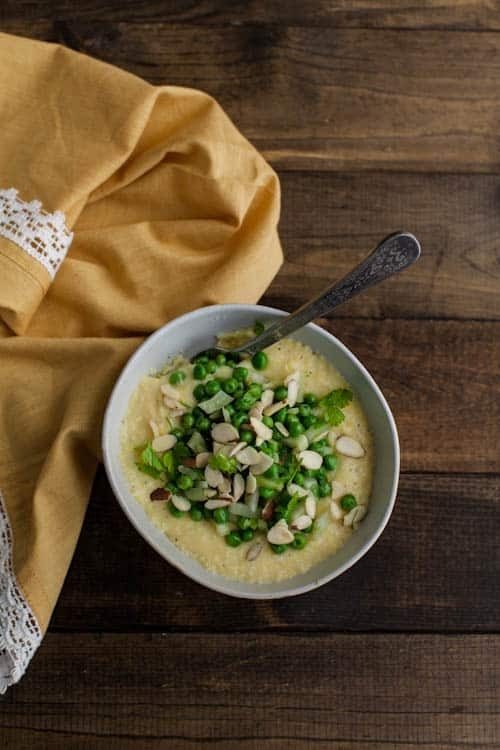 Now let’s talk about this recipe – adore polenta, and I even have fresh peas and fennel in the fridge. Thinking this is going to be a lovely weeknight meal. Thank you!! Love polenta and love fennel, sounds like a dish made for me! Beautiful fresh spring vegetables sound like a perfect pair with a bowlful of creamy, rich polenta. So good! And I’m jealous of your backyard lights. Now I’m scheming to string up some of my own! It’s so easy to get overwhelmed sometimes! I’m glad that your husband was able to help that you’re focusing on your exciting summer plans in California! And I love the handmade look of that bowl! This fennel, pea, and lemon combo sounds really bright and fresh. And good luck with the week. Thank god for partners, no?! Hang in there, Erin! Everything will get done and it will all be spectacular. It’s easier said than done – I feel just like you did most of the time. I have confidence you will get it all done and be able to enjoy all of the wonderful things ahead. What perfect timing: Fennel bulbs, parsley, and sugar snap peas are at my Bay Area farmers’ market right now. I’m thinking I could thinly slice the snap peas in place of the shell peas. But I am dairy-free—do you have any suggestions for what to use in the polenta in place of the butter, cream cheese, and milk? Thanks! What a beautiful polenta dish! I’ve forgotten how much I love polenta- looks like I”m going to have to give it a try again. 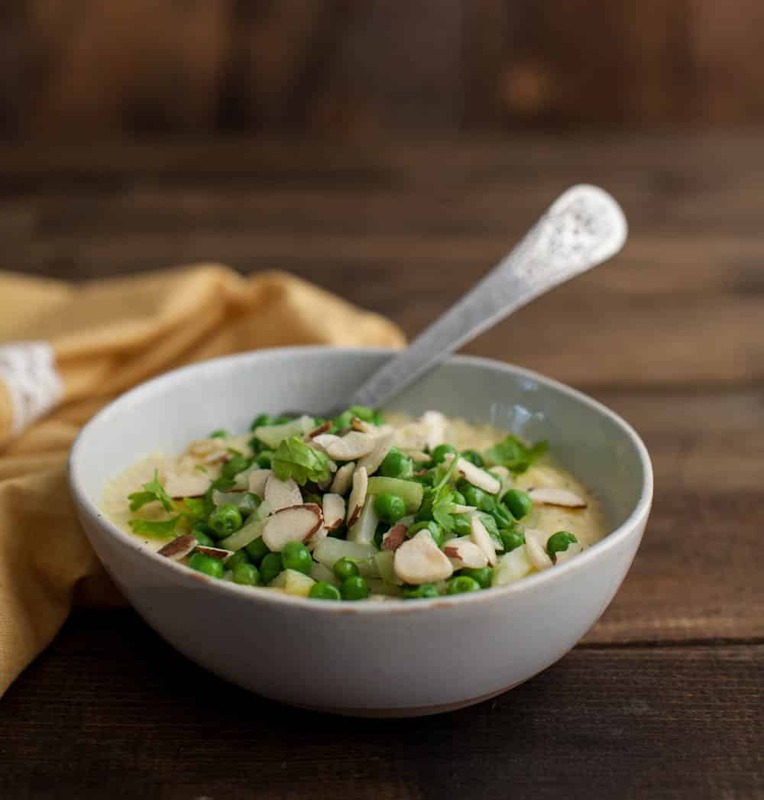 Love the idea to toss it with peas, fennel and almonds (gotta love the crunch factor). Oh girl, I definitely have those moments. Approximately weekly. Sending hugs!! Polenta is my go-to comfort food. It’s so easy and just feels so good going down! This may be an ignorant question, but is polenta the same as grits?